BARCLAYS is calling on businesses across the UK to join it in doing as much as they can to support members of the military and their families. 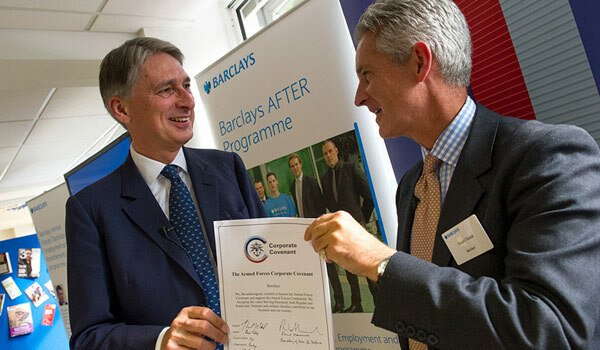 At an event at Alhambra House, in central London, Barclays signed the Armed Forces Corporate Covenant helping to ensure that no member of the Armed Forces Community faces disadvantage in the provision of public and commercial services compared to any other citizen. Barclays were joined at the event by Defence Minister Phillip Hammond MP and AFF’s Director Communications, Beth Spencer. She said: “This is great news for serving soldiers and service leavers. Barclays are committed to providing employment opportunities for service leavers believing that they can bring value to the banking industry. Barclays announced a number of changes to everyday banking which will help tackle some of the difficulties Armed Forces families can face. Any mortgage or unsecured lending application from military personnel will now be automatically reviewed if it’s declined based on gaps in address history. Calls to Barclays will also be free from Armed Forces telephones located abroad, meaning soldiers on operational tour will be able to spend their precious free 30 minutes per week calling loved ones and not the bank. It will also ensure that it’s easier to obtain authority to access bank accounts for a third party, such as parents or unmarried partners. The event also saw the launch of the Barclays AFTER programme, which assists wounded Service personnel in the transition into civilian employment when their military careers have been cut short by injury. It provides employability training, and work placements and employment opportunities at Barclays and its partner organisations. Both the AFTER programme and our key commitments within the Corporate Covenant will look at ways to support the development of broader military talent and the Reserve forces, as well as promoting fundraising efforts for military charities across the bank.